I brought just one book to India: It was a 570 pages hardcover on race and class. It is true, I did consider that it could be used as a weapon or a seat if needed. Still, it got me through a 30-hour train ride. I call it my “survival book”—without it, the long, hot days of travel would have been unbearable. What would your survival reading be? Before embarking on a trip of any extended length, many of us privileged enough to read this screen have an important choice to make—what book to bring? Yes, of course, those who have a kindle or tablet can essentially pack an endless number of books in their bag. But for those of us who prefer print or can’t afford the alternative, choosing the one or two books to haul along with us is a crucial decision. What did I choose on my most recent trip? 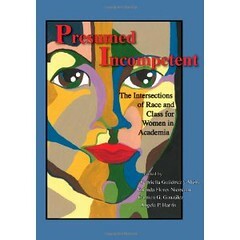 Presumed Incompetent: The Intersections of Race and Class for Women in Academia (2012, Ohio University Press) was the book whose 570 pages would keep me company throughout my trip to India, and help me sort out my thoughts as I delved further into academia by drafting a Ph.D application. It’s rare to find a book worth hauling across a foreign country. Though I was a bit embarassed at the weight of my bag, Presumed Incompetent deepened my understanding of the challenges women in academia face. You can preview the book here, I suggest picking up an actual copy. I do not necessarily recommend picking up an actual copy and hauling it around India, but in my experience, it makes not only a good seat but also an excellent mental support. If you were to pack only one book for a long trip, what would it be? Book, What Would It Be” and fun to sort out favorites and narrow it down to ONE! This entry was posted on January 30, 2013 by Lakshmi Sarah in B*tch Magazine and tagged academia, academics, books, feminism, women.